This outfit seems like something Amelia Earhart might have worn. Except none of my vintage pieces date back to the twenties when Earhart was setting her records. My jacket is from the sixties (it’s actually a men’s battledress jacket) and my scarf is from who-knows-when. 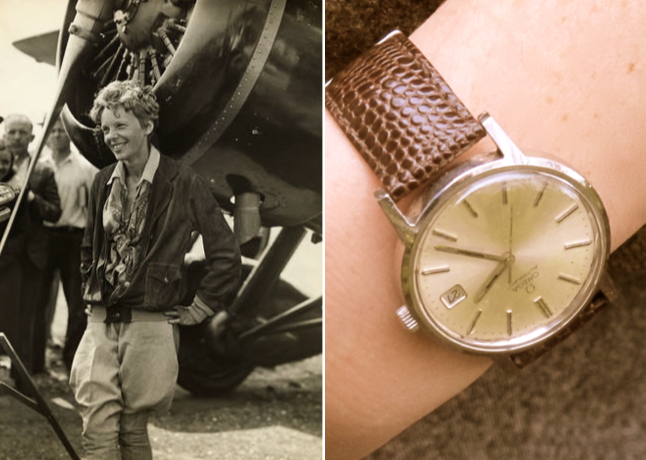 And as much as I love my vintage men’s Omega watch, nothing beats Earhart’s most notable accessory — an airplane. P.S. In case you’re wondering how to cater your own royal wedding-watching party, I wrote a little poem on VitaminDaily. How random! Just a few hours ago I was visiting an office with tons of framed images of Amelia Earhart. And she was a seriously stylish woman. And your outfit really does look like something she would have worn- chic and slightly masculine but still soft and attractive. Amelia is pretty much the definition of cool, minus the crashing and gone missing part. The short hair, the casual stance – an inspiration. And your outfit has captured it perfectly. I love that jacket, and I love Amelia Earhart. And you’re so right – girlfriend always looked good. 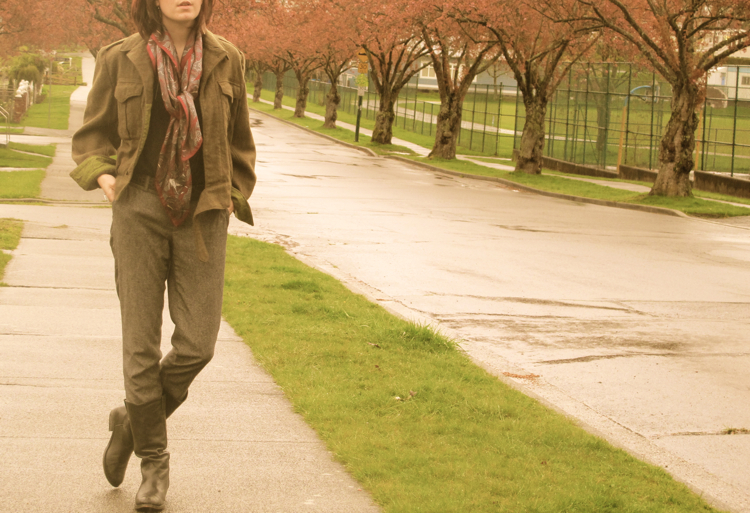 Amelia Earhart may have been a stylish aviator, but you’re one stylish Vancouverite! Seriously, I think I’ve told you this before, but you have the most amazing collection of vintage pieces. This ensemble looks great on you. All the pieces are loose fitting, but I like how it doesn’t overwhelm your frame. I would never be able to pull this off!